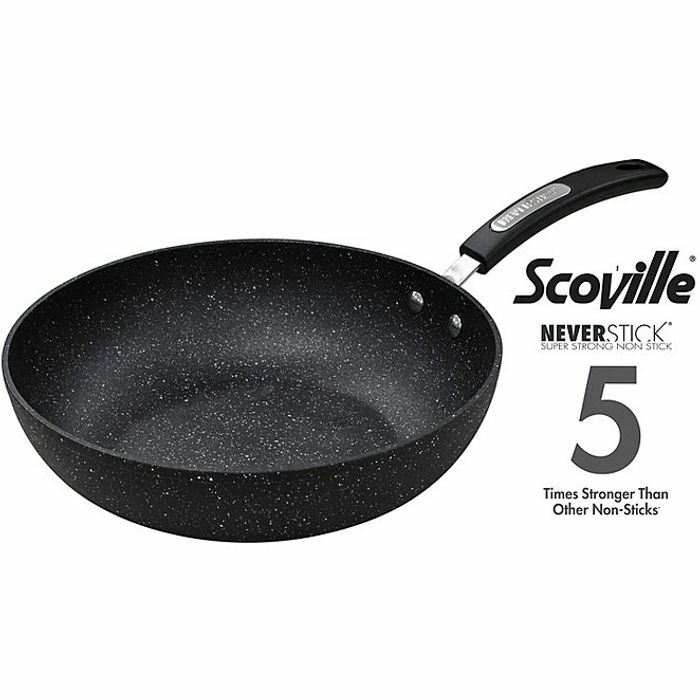 Scoville Neverstick 28cm Frying Pan Taking non-stick cookware to a whole new level, this Scoville Neverstick pan is made using an innovative new toughening system for a finish that never peels, never flakes and is 5 x stronger than ordinary non-stick pans. This means that not only will it last for a lifetime, but you can cook with little or no oil for healthier everyday cooking. It's made of quality 3.5mm forged aluminium for superior heat distribution and can be put in the dishwasher for easy cleaning. 5 x stronger than standard non-stick pans Made of 3.5mm forged aluminium Stay-cool riveted Bakelite handle Suitable for all hob types, including induction Dishwasher safe.